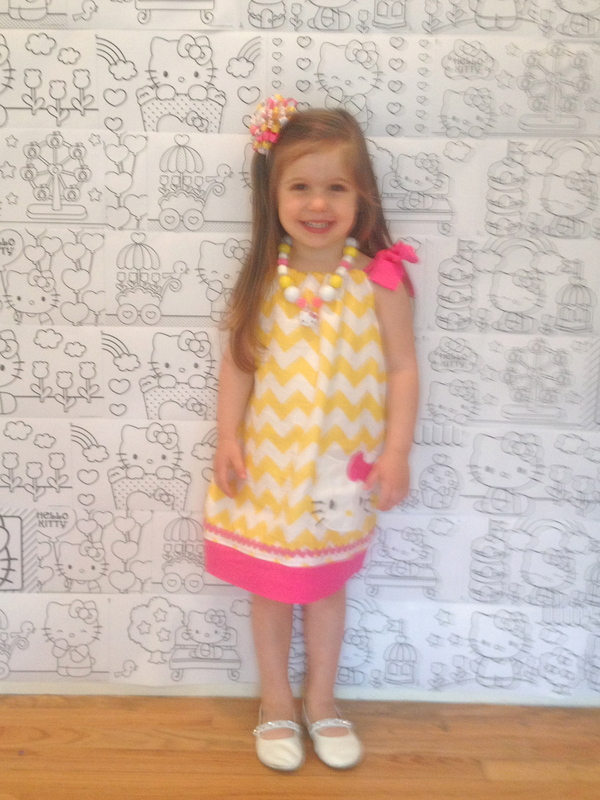 Say HELLO to Little Miss Molly. 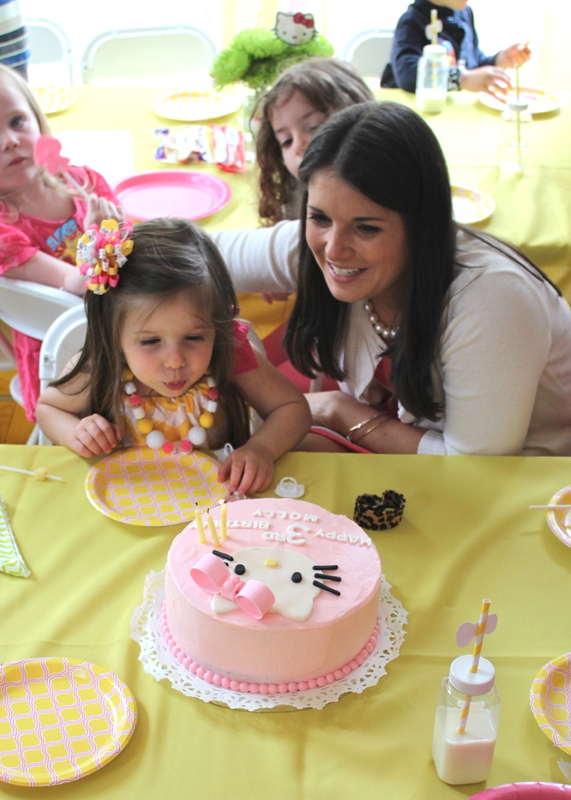 She recently turned 3 and we celebrated with a Hello Kitty party. 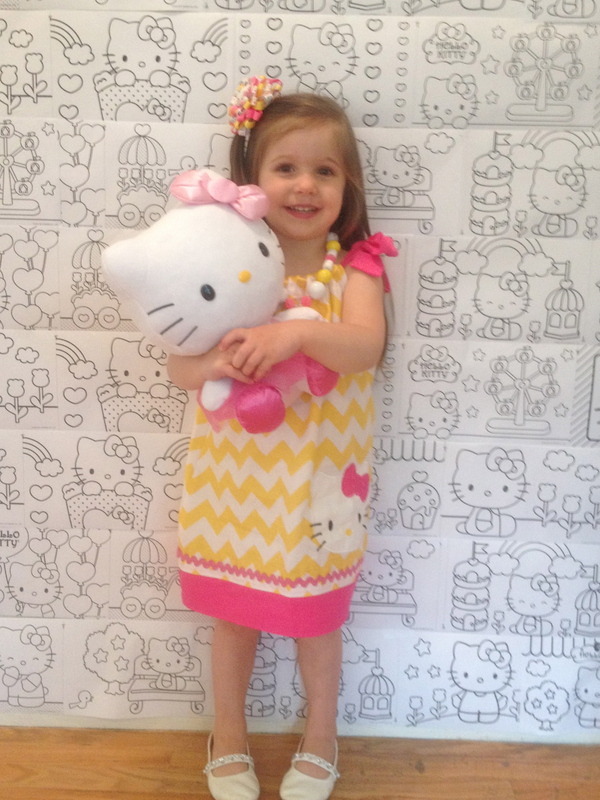 Molly LOVES Hello Kitty, so when she told me she wanted a Hello Kitty party I was happy to oblige. 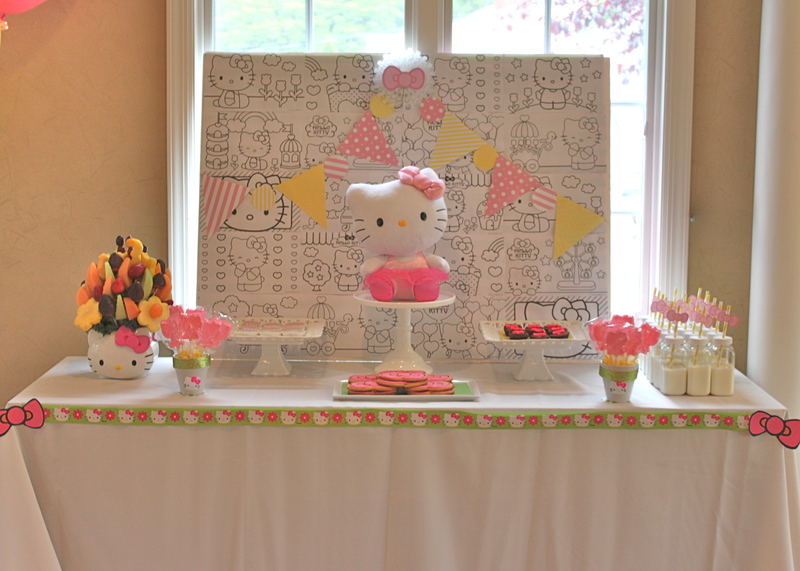 Hello Kitty is such an adorable character and I was excited to plan and create this party. 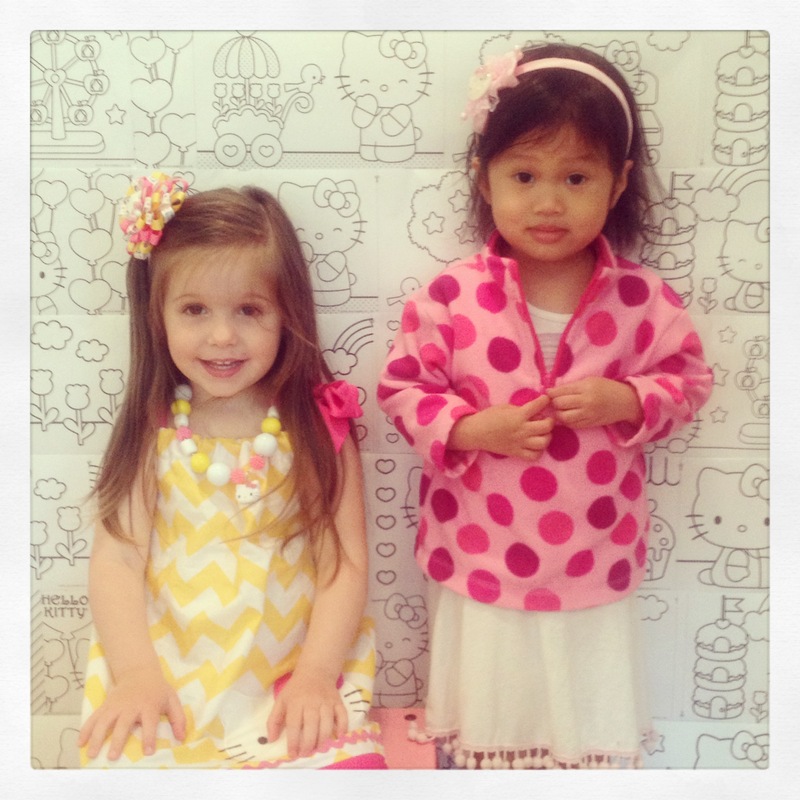 Molly attended preschool this year, so she made some sweet friends. 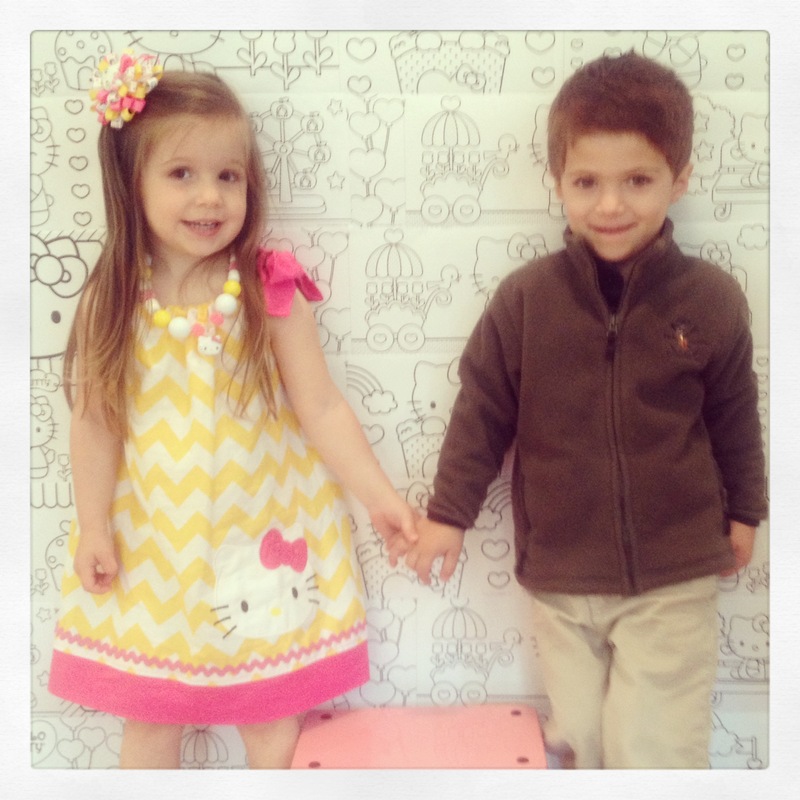 We invited the nine boys and girls in her class along with her Godparents and their four children and, of course, her sisters. 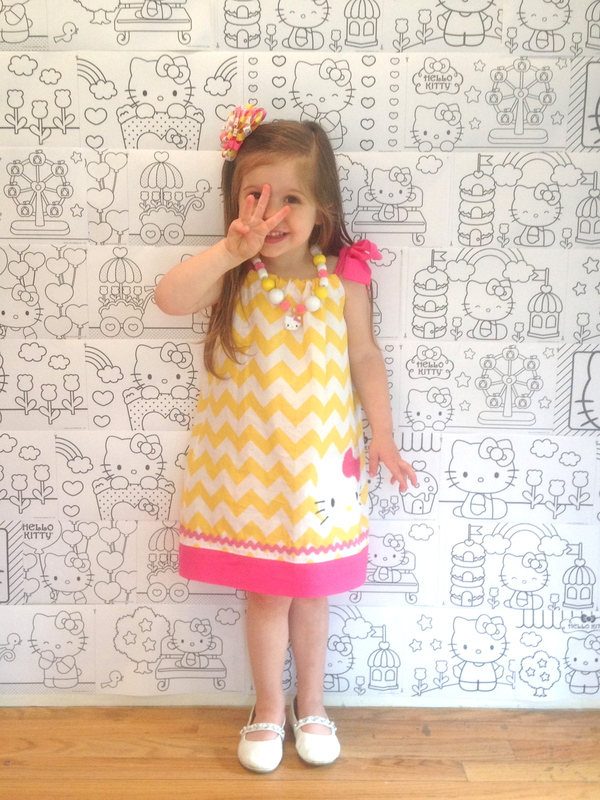 We sent these adorable invitations from Funtastic Parties on Etsy to her little friends. 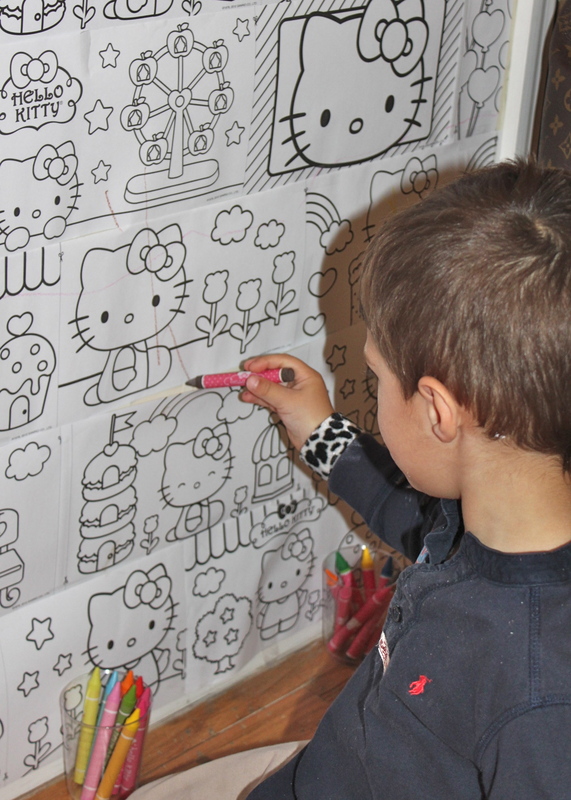 I found some rolls of Hello Kitty coloring sheets a while back at Michael’s. Initially, I bought them to put into party favor bags, but the night before the party I decided to use them as decor. 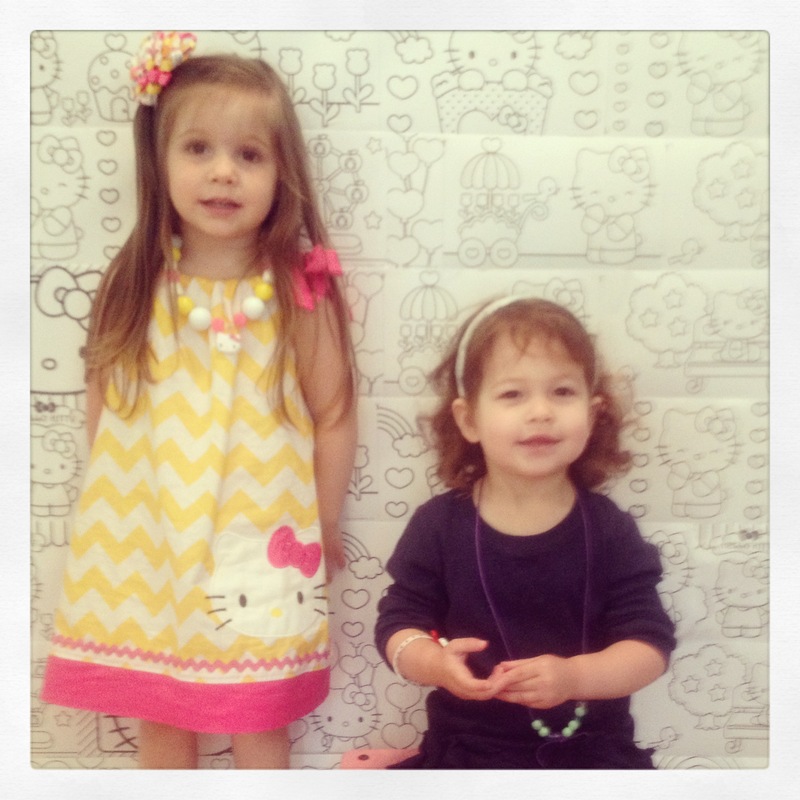 I unrolled them and taped them to craft board for the backdrop of the dessert table and also covered an entire wall in the entry way with them. 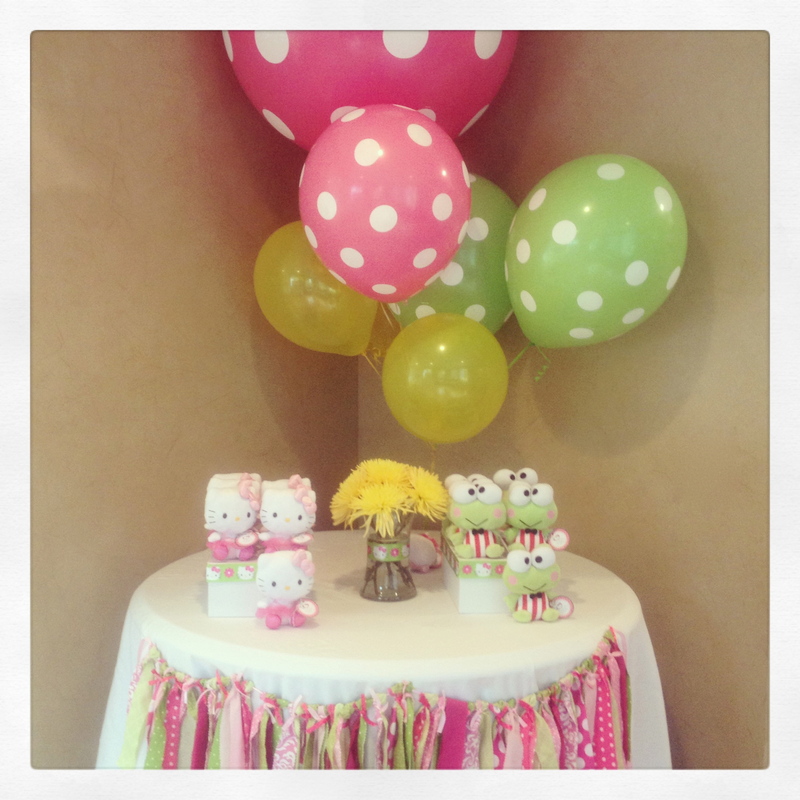 The dessert table was a sweet display of fruit, cookies, brownies, lollipops and milk. 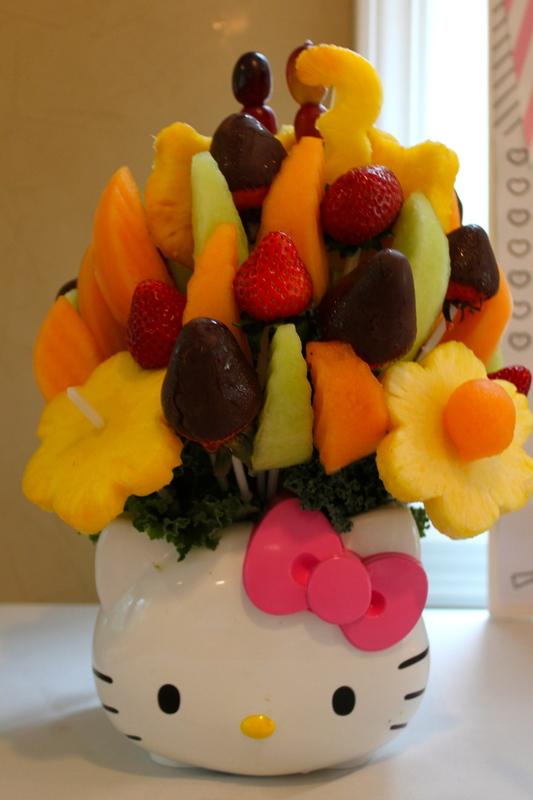 Edible Arrangements had a fruit arrangement in a Hello Kitty vase available so I ordered the fruit from them. I love how easy it is to serve and no prepping on my part. Easy peasy! 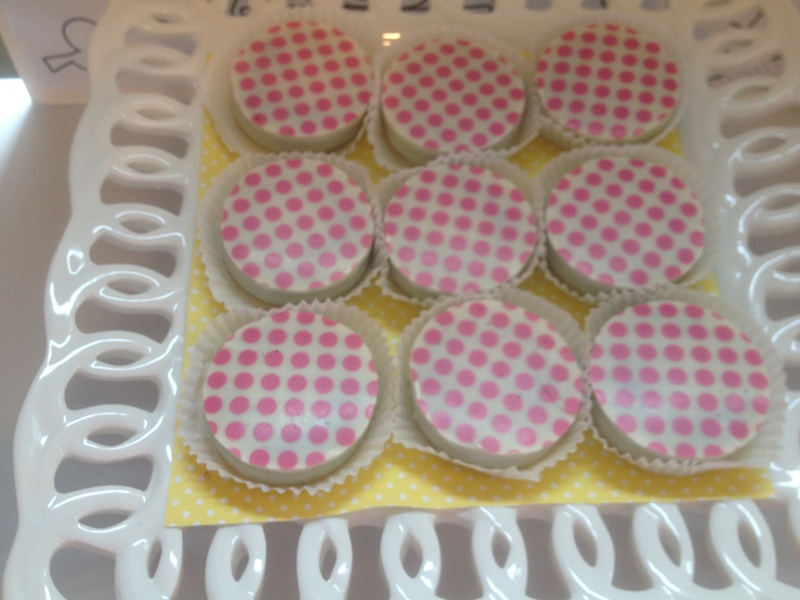 I got my favorite chocolate covered Oreos by Sweeties by Kim. 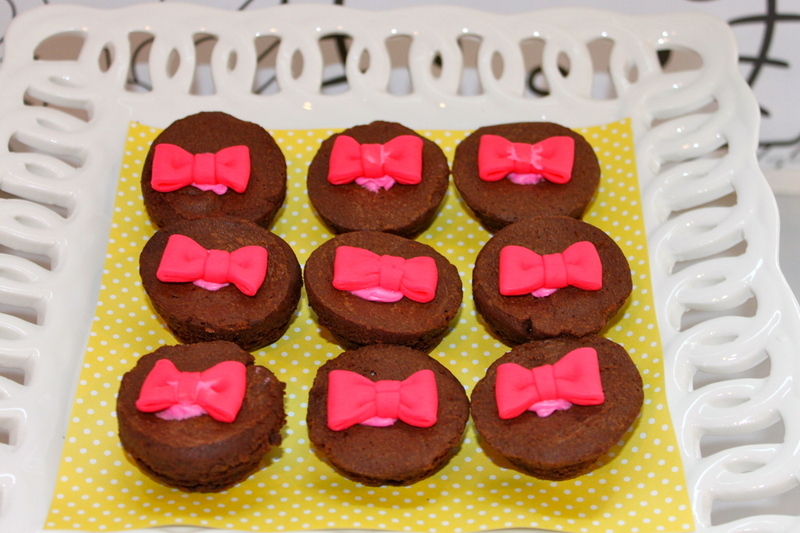 Store bought brownies were prettied up with fondant bow toppers from Shop Cupcake Central. 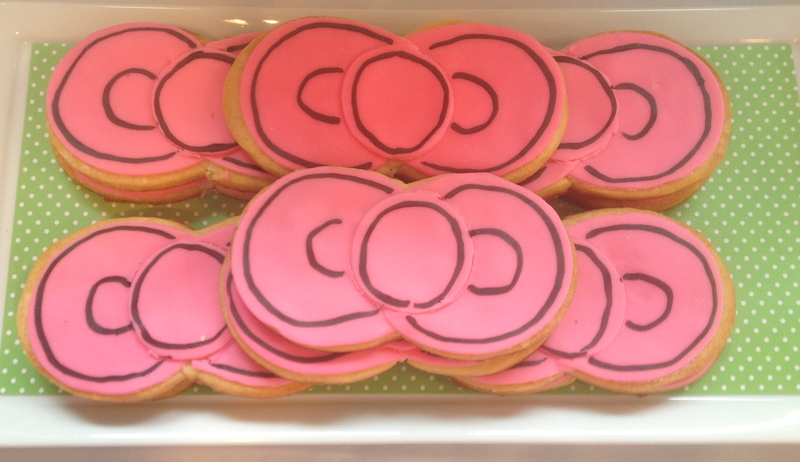 Bow shaped sugar cookies were made by my favorite cookie lady, Carrie Budke of Angel Cakes in Rye, NY. I found these adorable plastic milk containers on Etsy. The lid unscrews and it has a hole in the top perfect for paper straws. One word to the wise…DO NOT place them in the dishwasher. Mine melted, even on the top rack. I’m very sad about it, but will order more for sure. 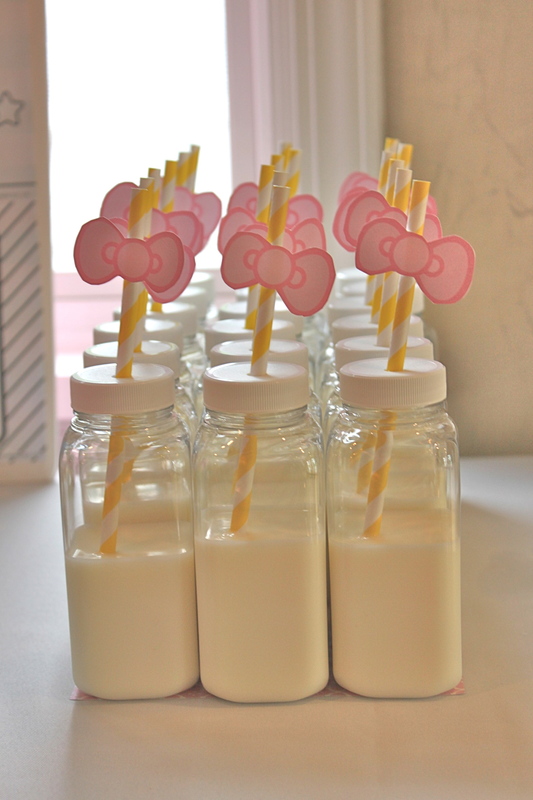 I found the milk bottles and yellow paper straws on Etsy at Cute Kids Food Box. 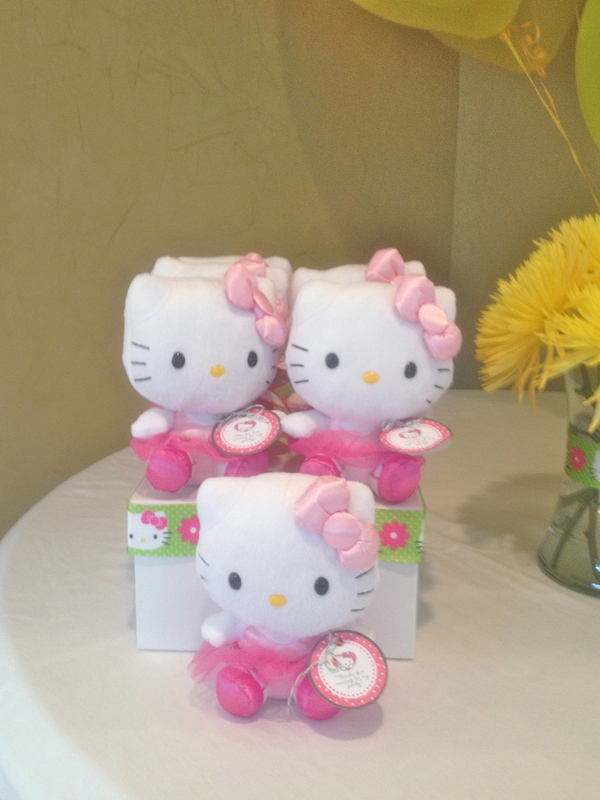 They have the most adorable party items available. I’ll be visiting them very often, I’m sure. 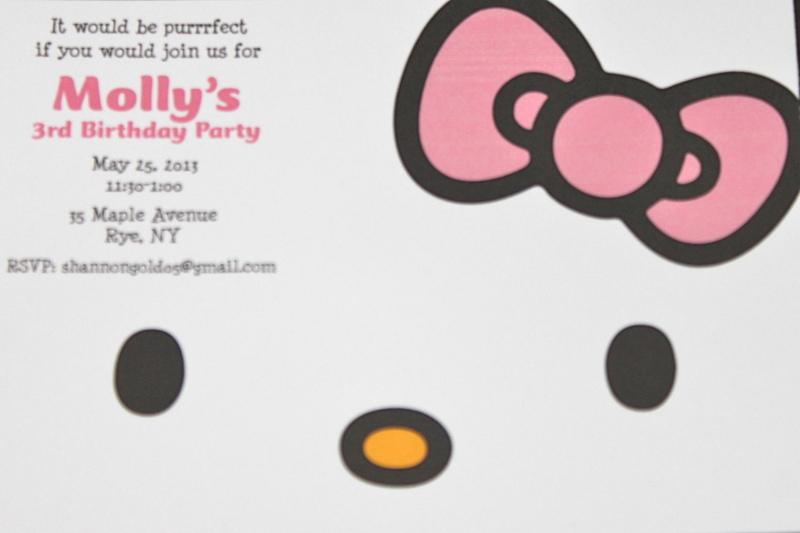 To add more Hello Kitty detail, I found a bow image online which I printed and cut out. I used glue dots to adhere them to the paper straws. 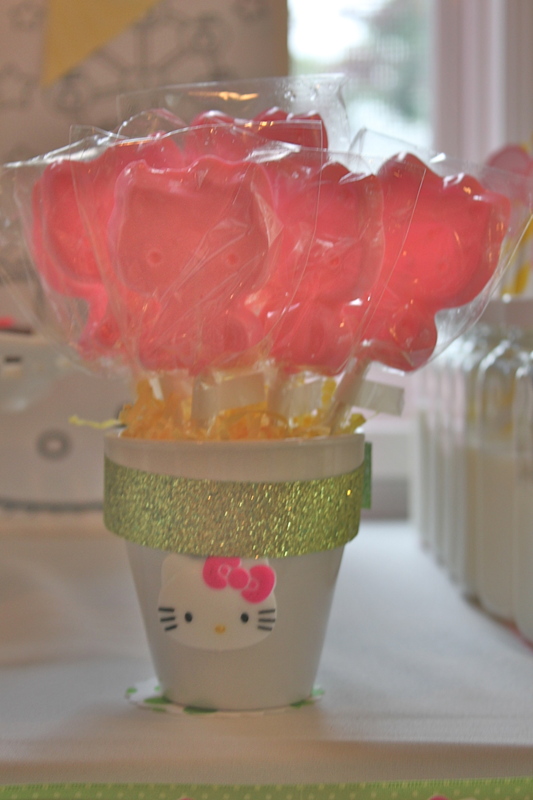 Molly wanted me to be sure to have lollipops (her favorite treat), so I found these Hello Kitty ones at Candied Cakes on Etsy. They come in many flavors and colors and were yummy! My friend, Daryl, started a cake business called Frosted by Daryl. 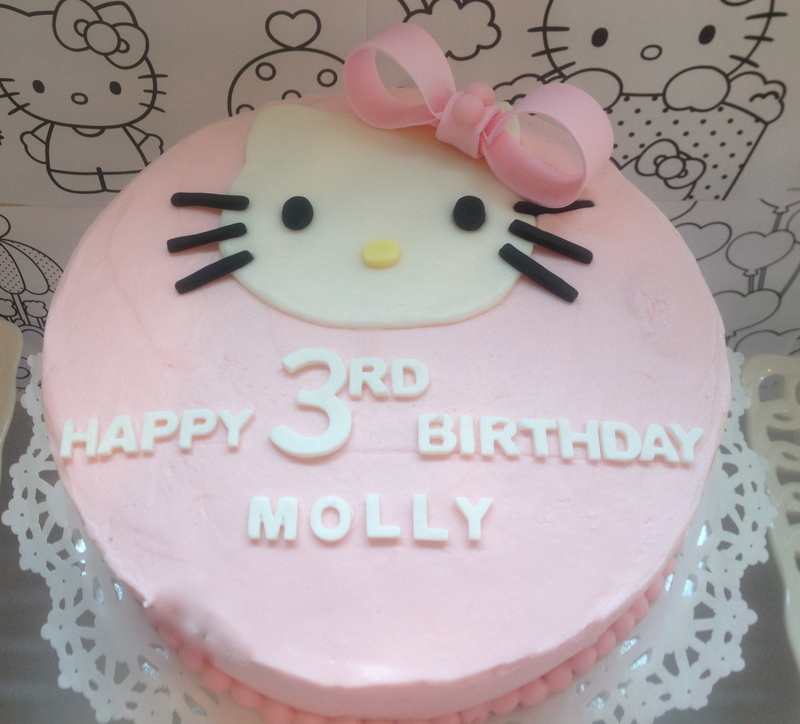 She makes gorgeous and delicious cakes and made this one for Molly’s party. It was so cute and YUMMY! 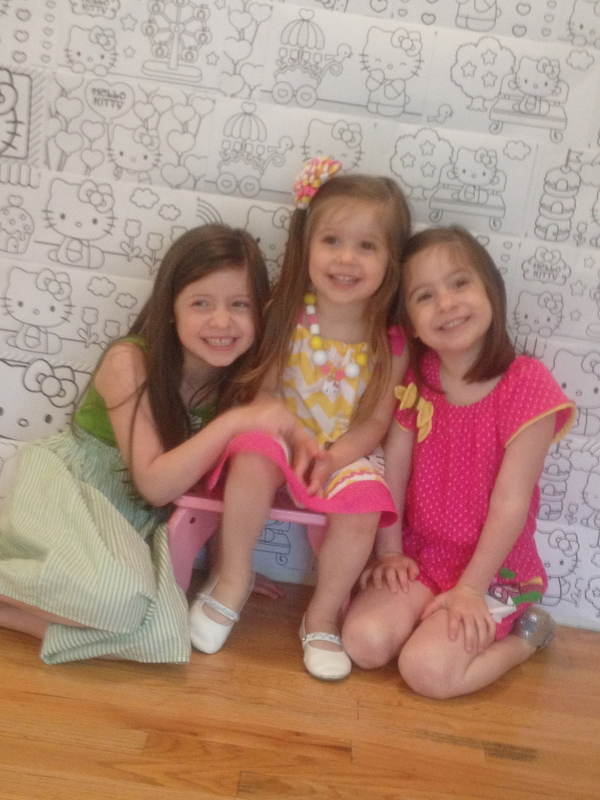 I was set to have the party outside in our backyard, however the weather forced us indoors. I switched gears at the last minute, cleared furniture from my living and dining area and decorated inside. 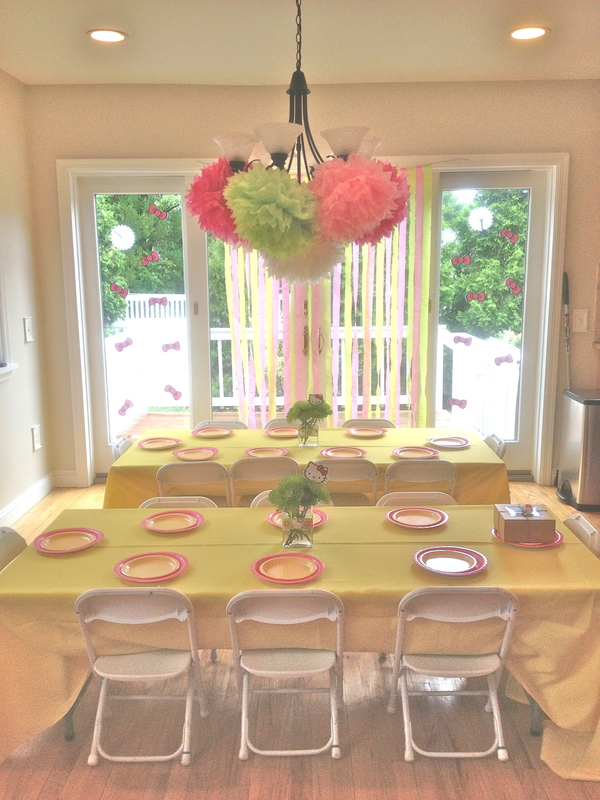 Here is how the kids’ tables looked in our dining area. 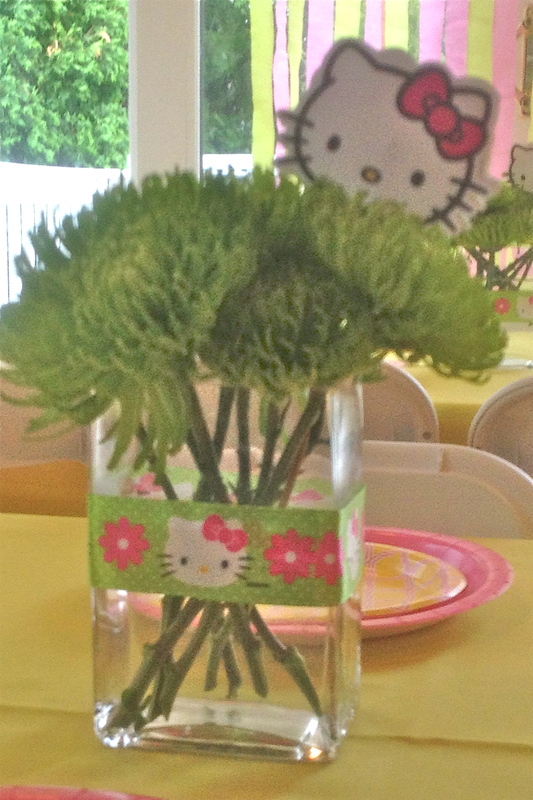 I used fresh flowers as centerpieces, tied Hello Kitty ribbon around the vase, and put a print out of Hello Kitty on a skewer to bring a touch of Hello Kitty to the tables. 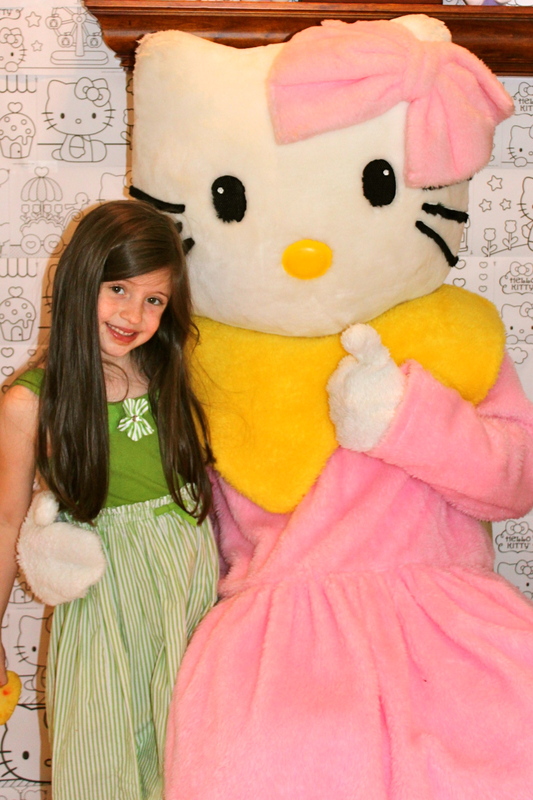 As Molly’s guests arrived she took a picture with each of them. 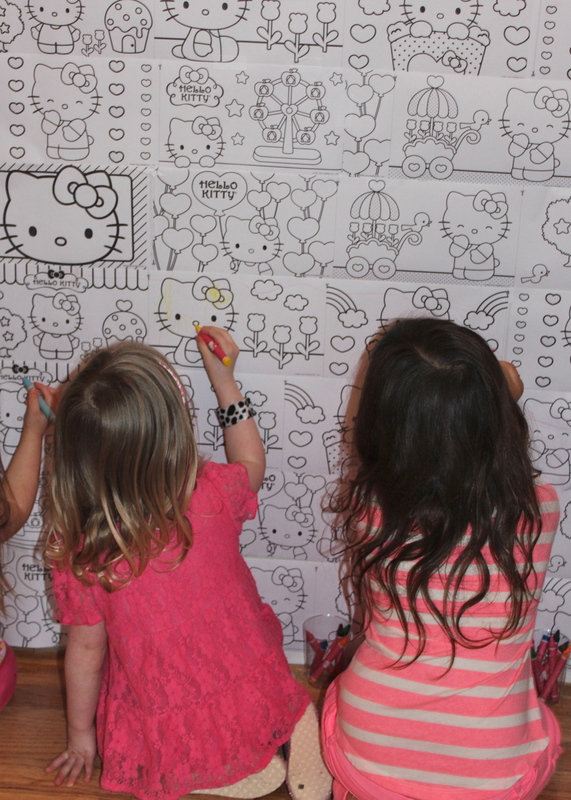 The entryway wall covered in Hello Kitty coloring pages made for the perfect backdrop for photos. I may use these in the thank you cards. 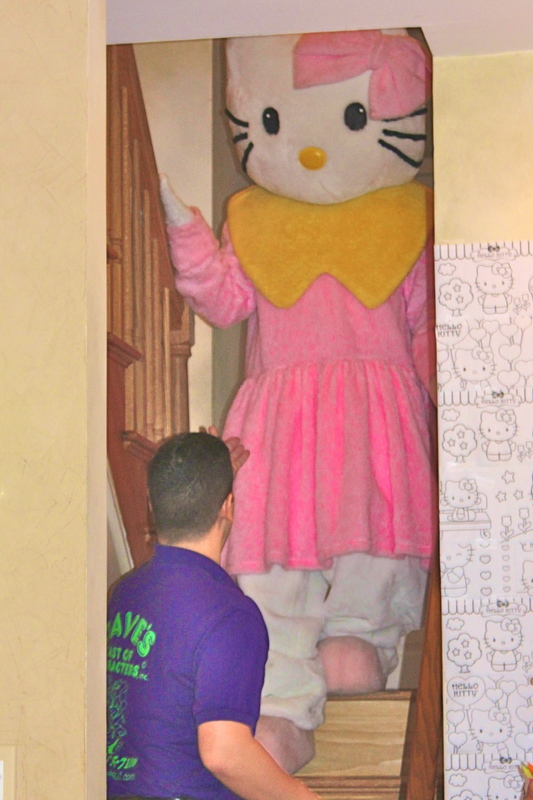 The kiddos were very excited to see Hello Kitty walk down the stairs. 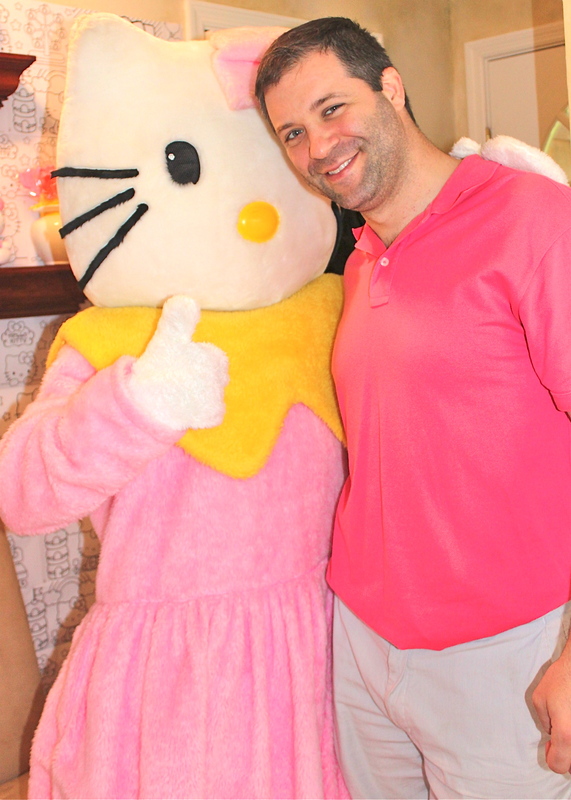 They enjoyed games and songs with Hello Kitty and the MC. After songs and games, we sat down for lunch. 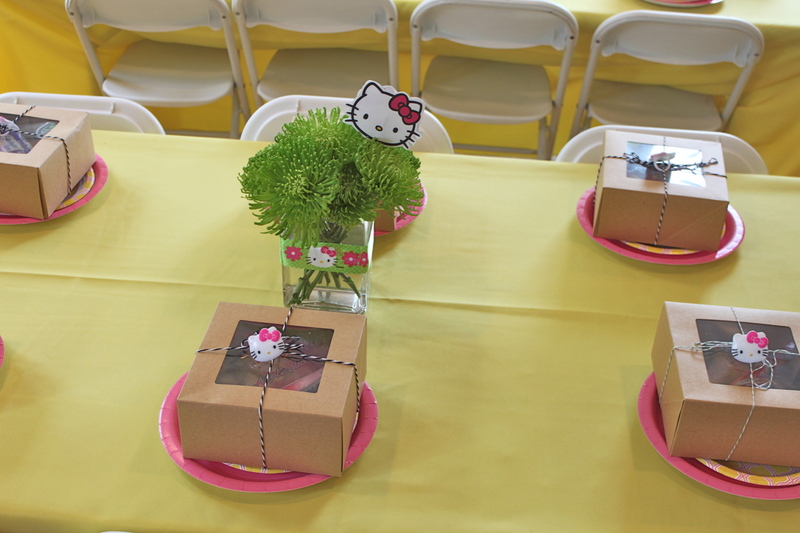 I put together little lunch boxes for each kiddo. I packed strawberry cream cheese sandwiches (I used a bow shaped cookie cutter to cut it), a package of organic apple slices, and a tube of organic strawberry yogurt. 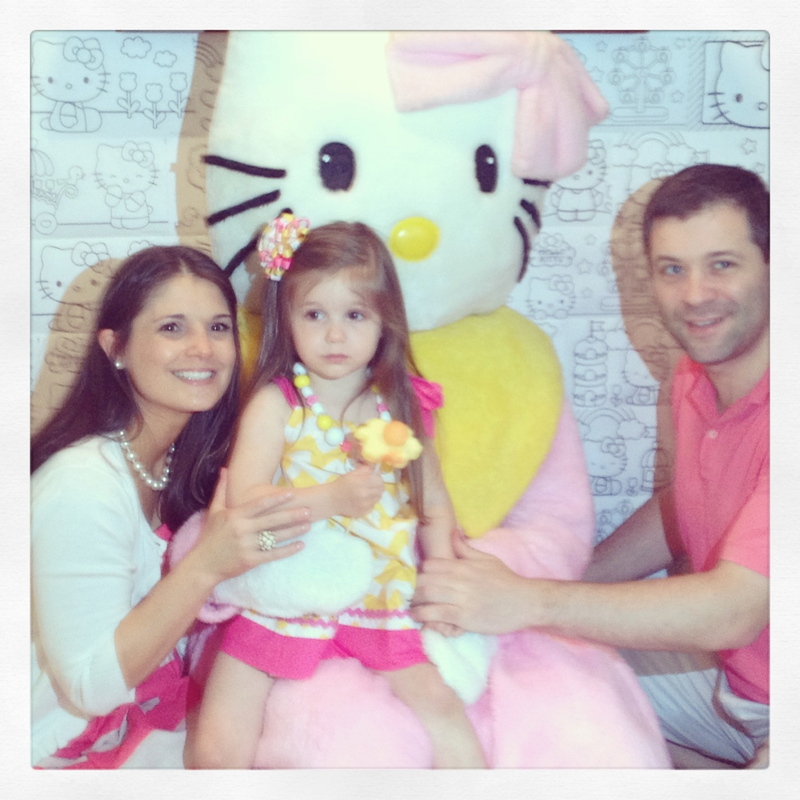 I tied a Hello Kitty ring on the box with baker’s twine. 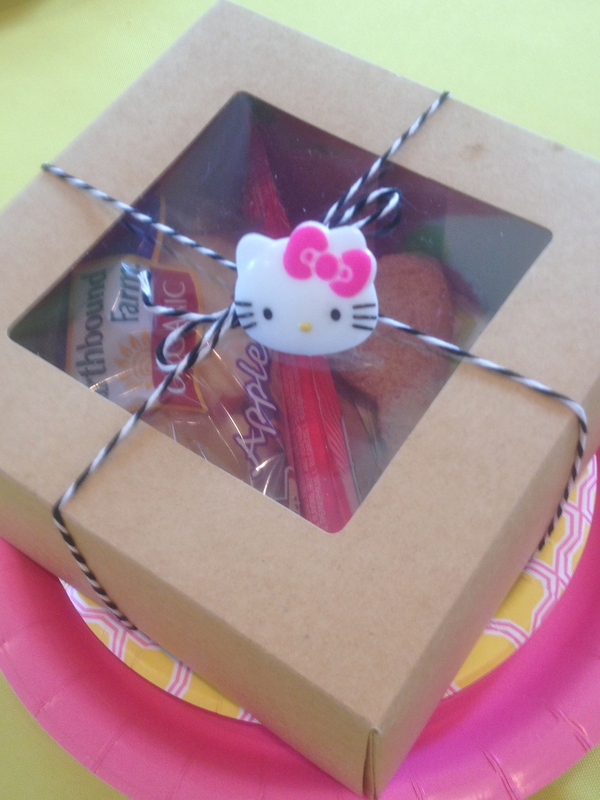 The kids loved having their own individual lunch kit and prize. A healthy HAPPY MEAL! 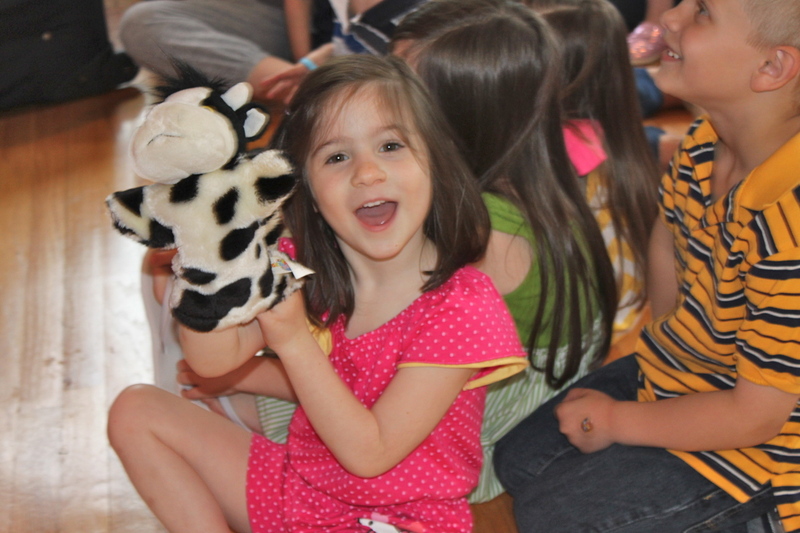 After lunch, it was time to sing happy birthday. 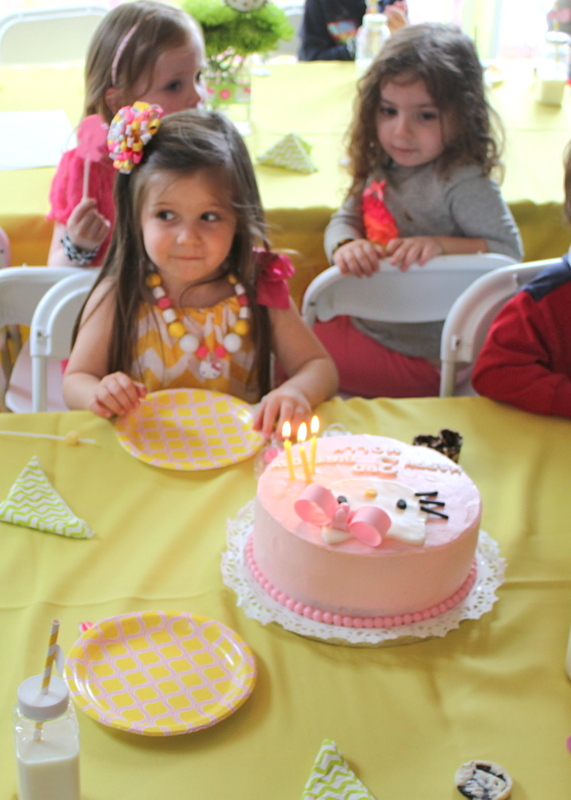 It took Molly three times to blow out her candles. 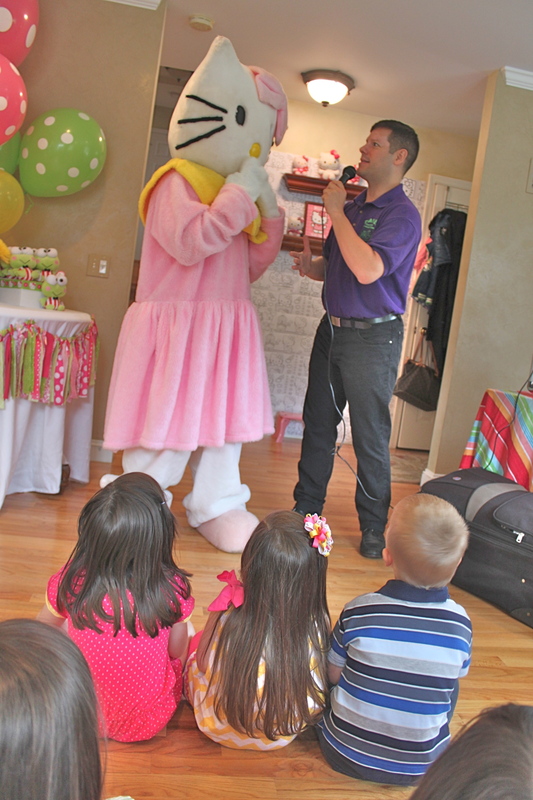 She was surprisingly shy being the center of attention. 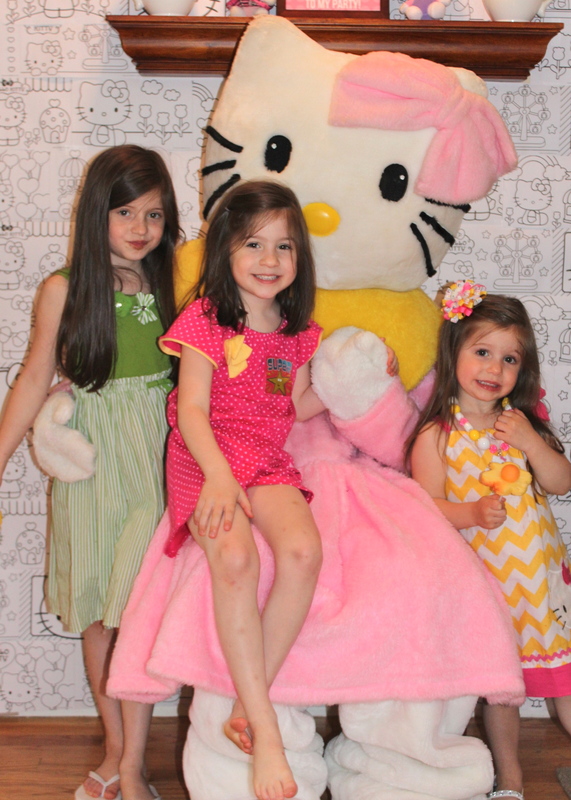 Hello Kitty stuck around after cake to take pictures with Molly and her friends. 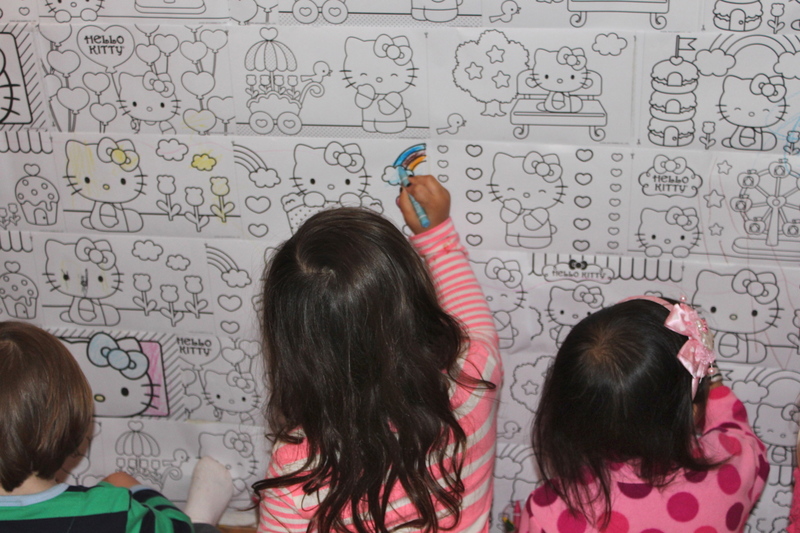 After Hello Kitty left and pictures were done, I let the kids have at it with the wall and some crayons. 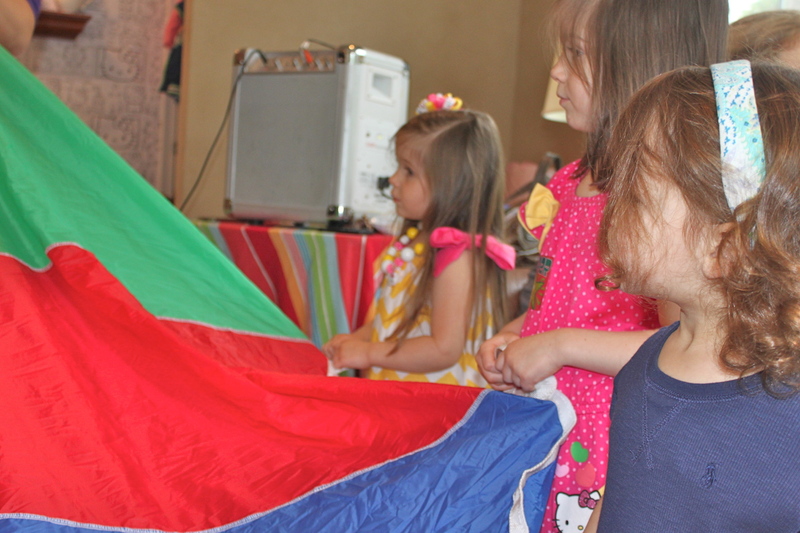 It ended up being great entertainment while the adults chatted. I’ll definitely use this idea in the future. I bought TY Beanie Babies for party favors. 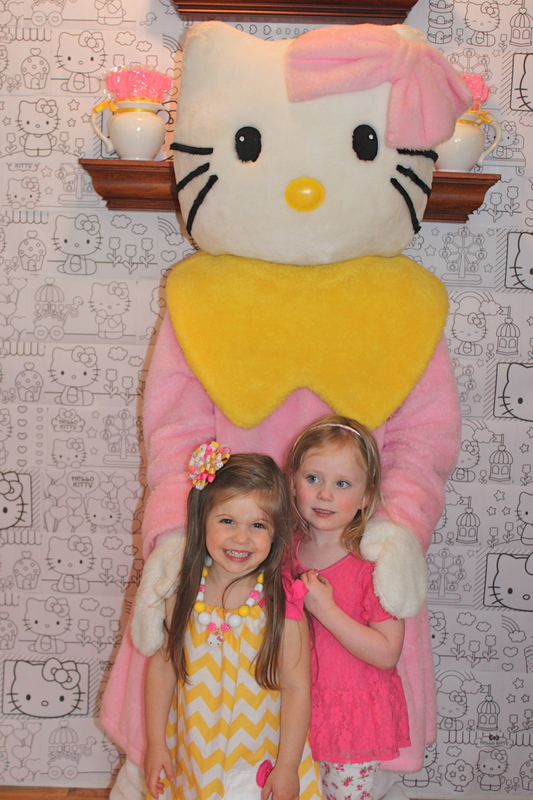 Each little girl went home with a plush Hello Kitty. 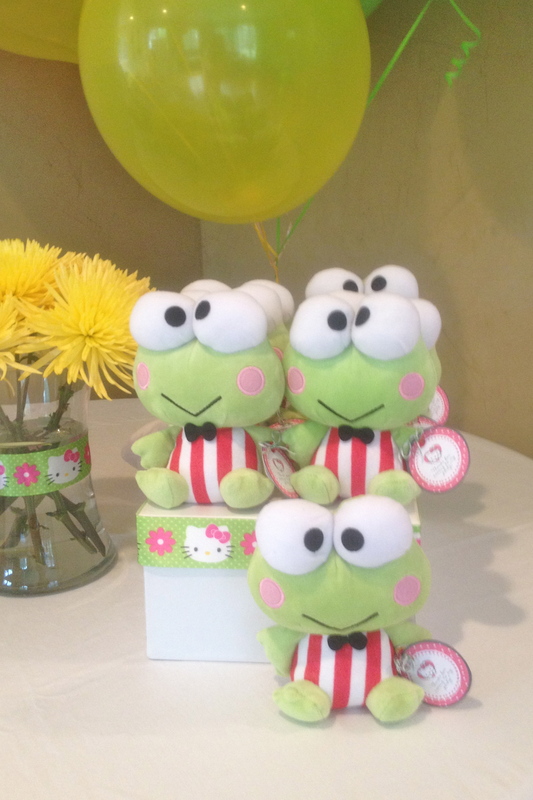 The boys got Hello Kitty’s friend, Keroppi the Frog. 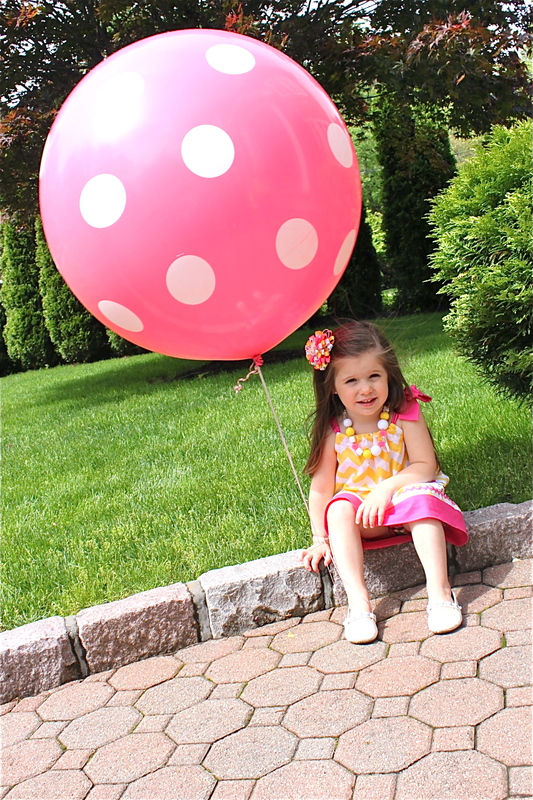 Molly loves balloons and this one is one of my favorite balloons ever. This thing was huge! 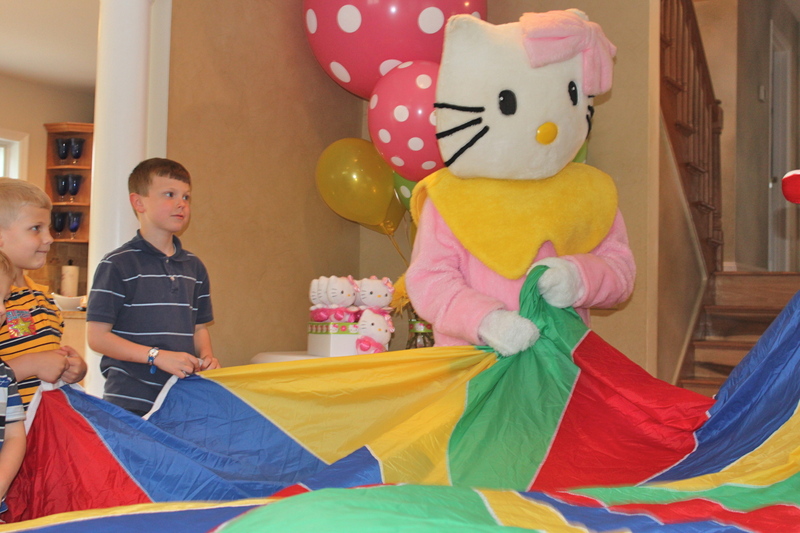 It was still inflated 4 days after the party. 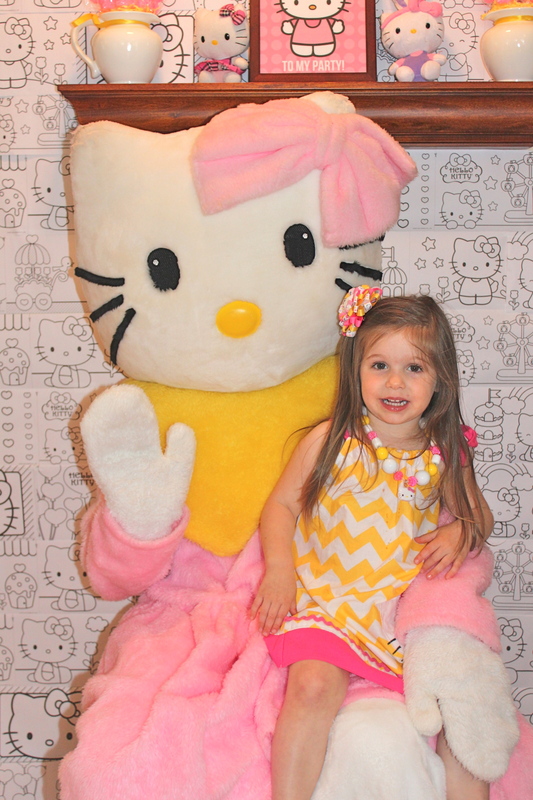 Molly had a blast at her party and loved celebrating with her friends and Hello Kitty. 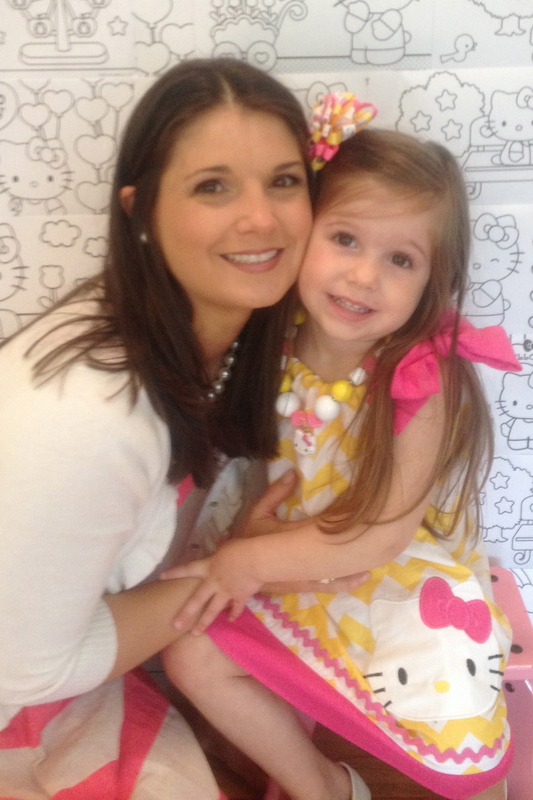 I love you with all my heart sweet girl. 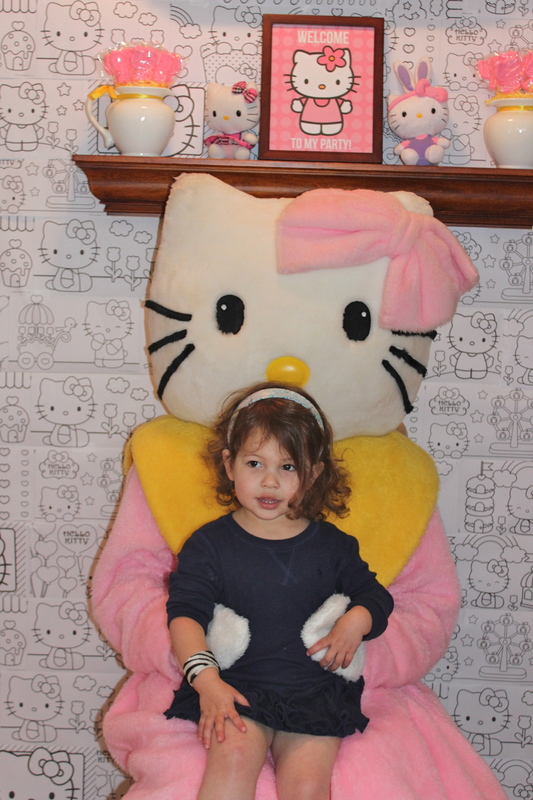 I am happy I could make your 3rd birthday so special. 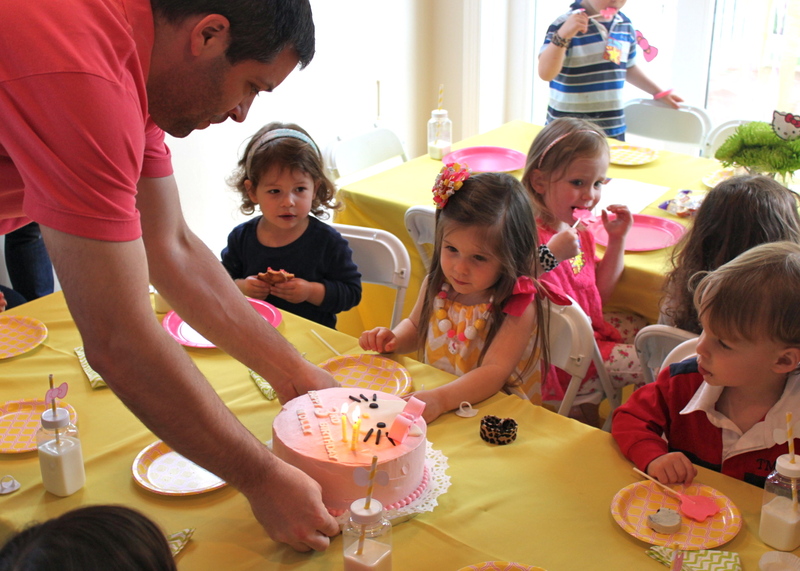 What a sweet party! 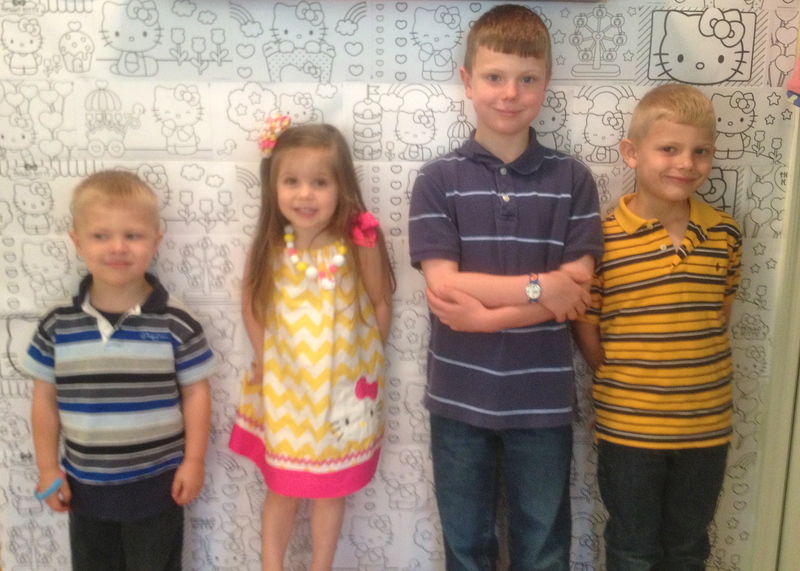 I love the coloring sheets for the backdrop. 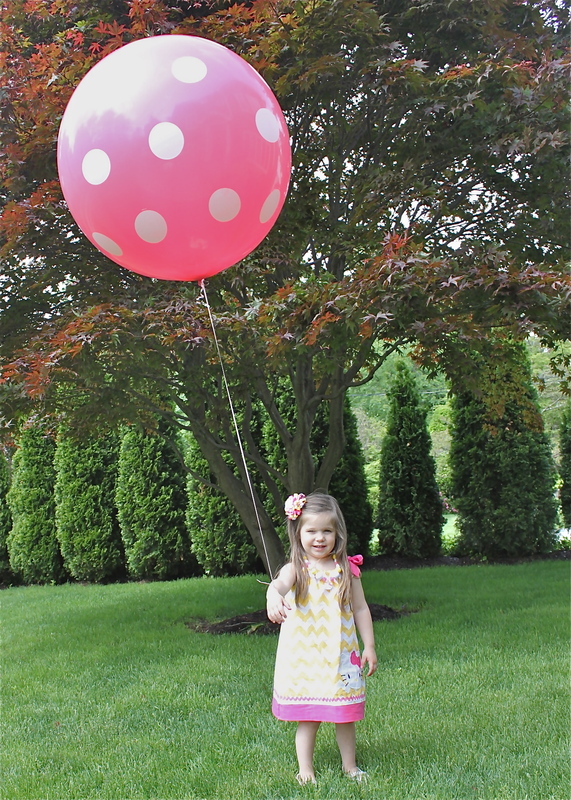 I featured you today for Living Creative Thursday! Thanks for sharing this creative party. 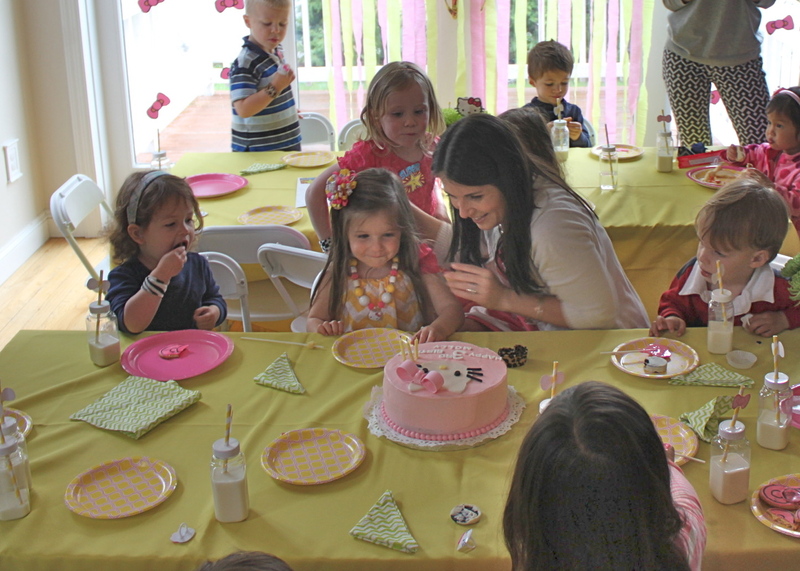 What an absolutely adorable party! Wonderful job! I’m your latest fan! How do you make Strawberry Cream Cheese Sandwiches??? ?Love the party!!! Hi and thank you! To make the strawberry cream cheese sandwiches i used Philadelphia Cream Cheese Strawberry- it’s usually in the cream cheese section at the local grocery store. I just spread the cream cheese on whole wheat bread and cut it in a bow shape with a cookie cutter. 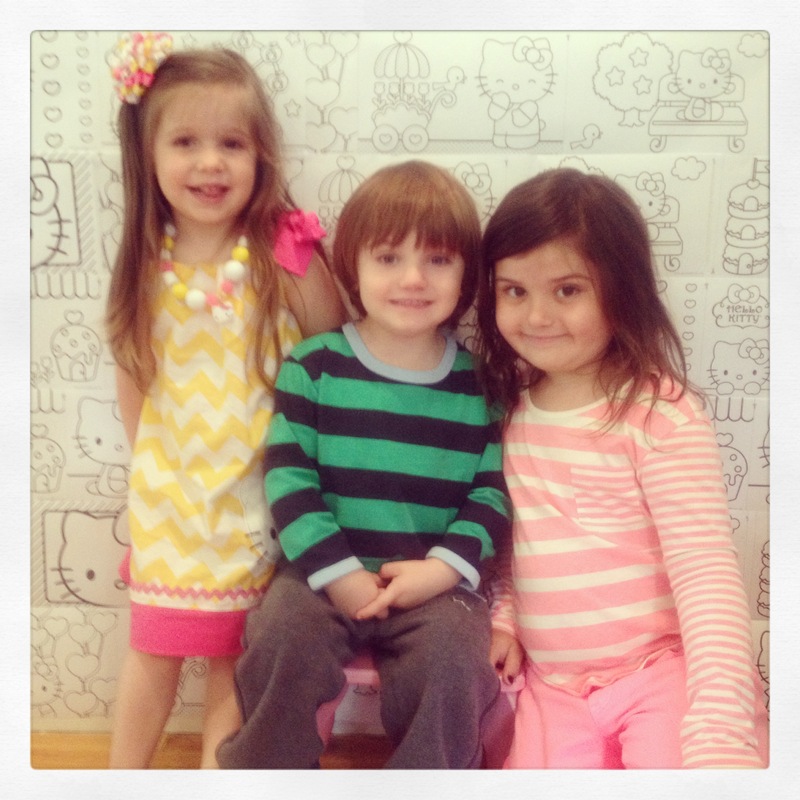 My kids also love strawberry cream cheese bagels and tortilla rolls. 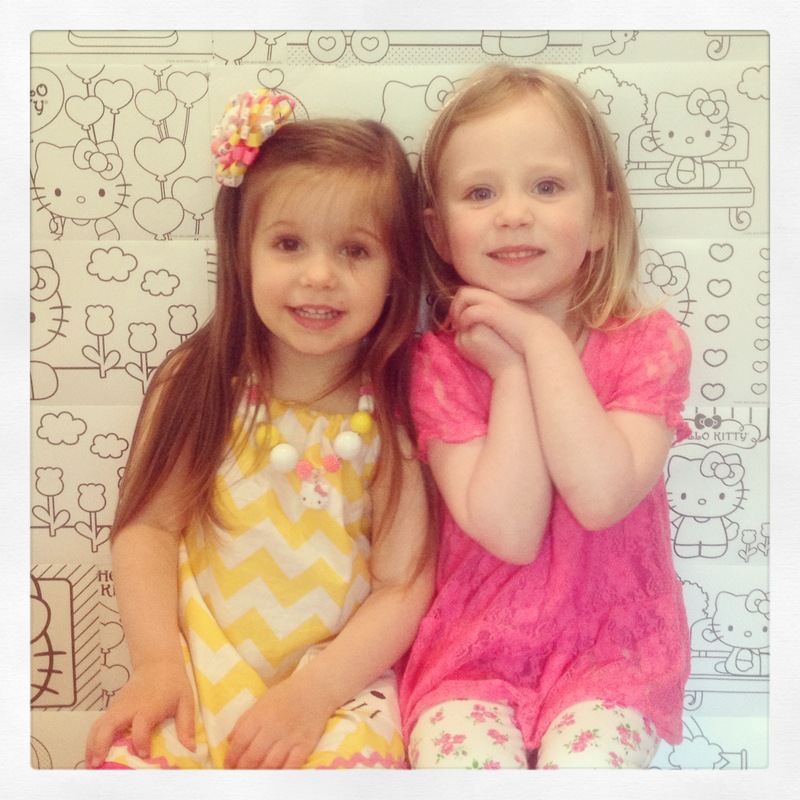 Follow Partying with the Princesses! Party Themes Select Category A Nightmare Before Christmas Abby Cadabby Fairy Party Arts and Craft Party Barbie Party Beauty Bash Christening Party Christmas Cupcake Party Cupcakes and Ice Skates Easter Halloween Party Hello Kitty Holiday Breakfast Treats Ice Cream Shoppe Party Lalaloopsy Tea Party Lemonade and Lollipops New Year’s Eve Olivia the Pig Party Themes Peeps (Easter) Party Petting Zoo Party Pinkalicious Party Popsicle Party Princess Tea Party Rainbows/Care Bears Shopkins Party Snowflake Holiday Party Strawberry Theme Sweet Shoppe Party Tea-Rex Dinosaur Party Valentine’s Day Welcome!